-The desoldering iron gun if controlled automatically by the micro-processor. -The heating element is made of PTC and the sensor on the desoldering tip can control the desoldering temperature quickly and accurately. 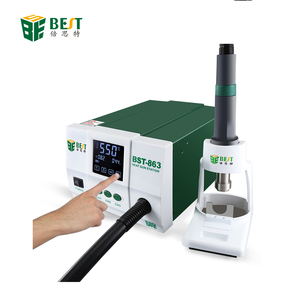 We are one of the largest soldering iron and soldering station exporters in China. Designed with a separate power block which houses the transformer and safety fuse. Please pay within 5 days if immediate payment is not required on your purchase. Shipping: Please see the shipping method/carrier for this item under the Shipping above. 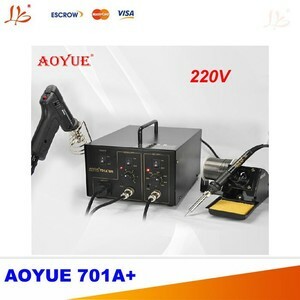 Hot sell ACHI IR6500 BGA Rework Station Simple Description: Highlights of this ACHI IR6500 DIY IR BGA Reflow Rework Station Price Good 1. USB interface. 2. 2 temperature zones 3. With tempering glass,more uniform heating 4. Hot sale model, praised by many customers. 6. Technical support is always available 7. Original Factory, look for worldwide distributors Main Features: Where this ACHI IR6500 DIY IR BGA Reflow Rework Station Price Good can be used for 9 1. For repairing Mobile phones 2. For repairing Notebooks/ 3. For repairing game consoles, especially for XBOX360/PS3/WII 4. For repairing any other mainboards with size from 22x22mm to 500x400mm 5. For preheating chips or mainboards before soldering to improve rework efficiency. Temperature stabilization and is impervious to air. Use the brushless fan,and long life and low noise. Such as buzzer and external interface of mobile phone. 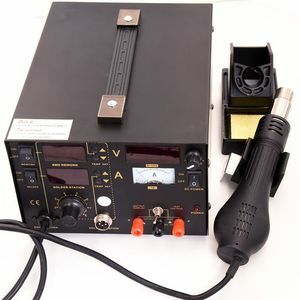 2 in 1 ESD Electric Soldering Iron Eruntop 8586 Hot Air Gun SMD Desoldering Rework Soldering Desoldering Station Rework Station: Working Voltage: AC220V &plusmn; 10% 50Hz Output Power: 700W Temperature Range: 100&deg;C~450&deg;C Temperature Stability: &plusmn;5&deg;C Air Flow: 120L/min (max) Soldering Station: Working Voltage: AC 26V 50Hz Output Power: 50W Temperature Range: 200&deg;C-480&deg;C Temperature Stability: &plusmn;2&deg;C(static) Ground Impedance: &lt;2 Ohm Ground Voltage: &lt;3mV Package insdie: 1 x 8586 2 in 1 Soldering Station 3 x nozzles 1 x ic pick 12x solder iron tips 6 x tweezers 2 x solder wire 1 x cp wick 1 x brush 2 x heat element(1 for hot air ,1 for solder iron) 1 x knife with balde 1 x suction pen 1 x golden wire ball soldering 1 x phone open tool kit Note:We have this kit in stock of Russian warehouse can send to Russian buyer from Moscow. 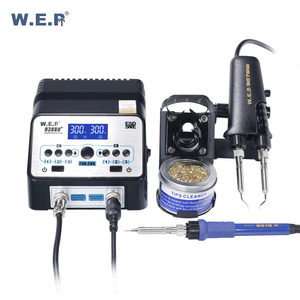 11 YRS Taian Puhui Electric Technology Co., Ltd.
Alibaba.com offers 4,735 desoldering station products. About 76% of these are other welding equipment, 2% are electric soldering irons, and 1% are other hand tools. A wide variety of desoldering station options are available to you, such as free samples, paid samples. There are 4,735 desoldering station suppliers, mainly located in Asia. 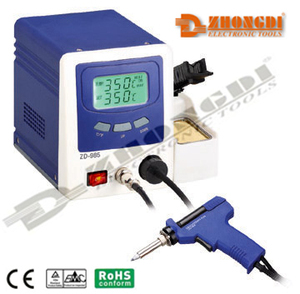 The top supplying country is China (Mainland), which supply 100% of desoldering station respectively. 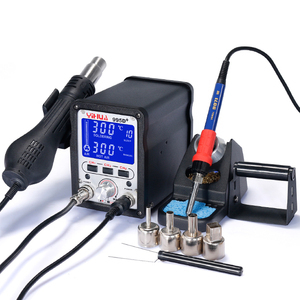 Desoldering station products are most popular in North America, South America, and Domestic Market. You can ensure product safety by selecting from certified suppliers, including 3,169 with ISO9001, 140 with ISO14001, and 24 with Other certification.